Cali Shade Sails has been providing the needed livestock shading requirements in all of southern California. We are the leading provider of livestock shading needs in the neighboring ranches. We also provide the shading requirement for horses, cows and various other animals of Chino, CA and San Bernardino, CA. Our expertise in protecting livestock in areas of Riverside, CA and Pomona, CA by providing the best Cali Shade Sails for livestock has received compliments from livestock owners for having their animals well protected by our products. We also install Cali Shade Sail covers in livestock in Rancho Cucamonga, CA. Having there for a long time, Cali Shade Sails have saved their livestock from possible heat stroke that may harm the animals because of the extreme high temperature in these areas. 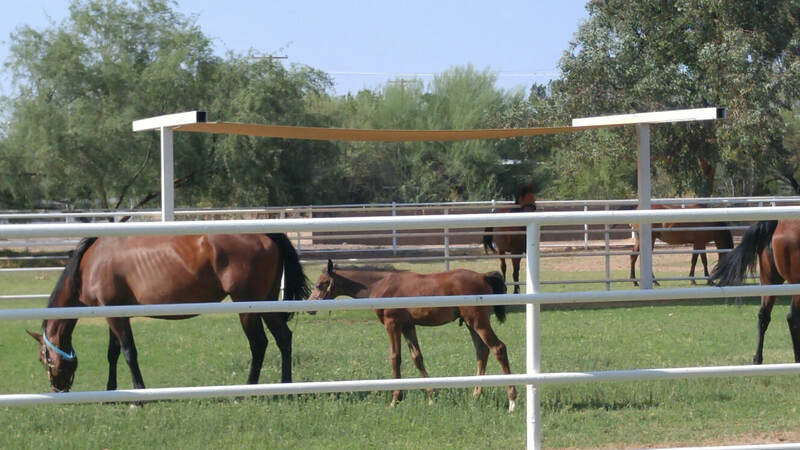 Cali shade sails has performed par excellence in the field of protecting livestock in areas of Chino, CA. Ranchers and piggery farms have acquired the services of Cali Shade Sails long time ago and we maintained our being number one in this field of business. Cali Shade Sails also provided the needed protection from extreme weather conditions of San Bernardino, CA whose extremely high temperatures has been experienced in the ranches. Cali shade sails has provided the livestock the proper shading requirements of the animals in this time of extremely high temperature and long summer drought. Cali Shade Sails also was able to provide the necessary protection of poultry farms in Riverside, CA. Shading requirements for these poultry farms has been provided and installed. We supply farms the necessary shading requirements during highly extreme temperatures of the day. Shading requirements to farms are provided to protect the animals and keep them healthy, happy and cool. We were able to immediately provided shading protection for the livestock in Covina, CA and Ontario, CA during the long summer where these cities experience high temperatures during the day. Livestock protection were also noted when Cali Shade Sails was invited to provide the necessary shading requirements of livestock in Rancho Cucamonga, CA. Hundreds of livestock were saved from the soaring heat of summer last week. It was timely that the ranchers were able to contact Cali Shade Sails before the extreme climatic weather conditions hit the areas. Cali Shade Sails was able to advice the ranches and farms of the impending high extreme temperatures has been monitored by NASA satellites. Today, Cali Shade Sails has been making history in providing protection for livestock in areas of San Bernardino, CA and Riverside, CA from heat stroke that could have damaged the animals if not of the immediate intervention of Cali Shade Sails for their clients in the area. Cali Shade Sails has been providing not only the needed shading requirements of our livestock, we also give our rancher, piggery owners and poultry raisers the day to day weather conditions of our farms and quickly provide the necessary shading cover if necessary. Our company is number one in providing the necessary precautions to our farmers and livestock owners because Cali Shade Sails is a service provider and our maxim to serve the best and the best we will serve. We are the front runners in providing shade requirements for livestock in areas of Corona, CA. We have the best relationship with our clients in the field of livestock protection. We have received posited compliments from our clients and we were being recommended by those who have experienced our services. We are serving the livestock owners in Chino, CA during the time they needed as most. We informed them ahead when they needed our information regarding weather conditions and we discuss with them openly the possible worst scenario and what should be done to protect the animals. We have been the front runner inthe business because we believe protecting the interests of our client is a MUST. Today, we were able to maintain our good business relationship with the farmers and ranchers of Covina, CA and Fontana, CA. Our expertise in the field of providing the needed shading requirements of the animals was able to provide protection of our clienteles investment valued in millions of dollars. We have been in the forefront in providing livestock shades and people’s shade during rancher’s festivities. We were featured in some rodeo games and we support sporting activities in the farms and in the ranches. Today, our unblemished relationship with the farmers and ranchers of Pomona, CA and Chino, CA were being cited in lieu of our relentless support of their sporting activities of the farmers and ranchers of the area. We have been number one in providing shade covers and support for our livestock during time of extreme weather conditions affecting these areas. Call us today or request a free on-site estimate!